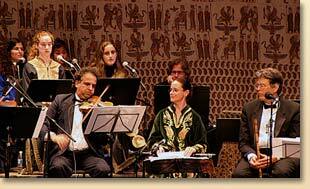 The UCSB Middle East Ensemble (MEE) is an official “Ethnomusicology Performance Ensemble” in the UCSB Music Department. Founded in 1989 by ethnomusicology professor Scott Marcus, the ensemble has performed widely throughout California and in Tucson, Arizona, and Washington D.C. In Fall 1999, seven members of the Ensemble performed in the Central Asian country of Uzbekistan as the sole U.S. representatives at the International “Melodies of the East” Festival in the city of Samarkand. In July 2010, the Ensemble traveled to Egypt to give a series of concerts sponsored by the Egyptian government’s Ministry of Culture. With a group of 54 musicians, singers, and dancers, the Ensemble presented nine concerts over a two-week period, the highlight being four performances at the Cairo Opera House, the premier performance venue in Egypt, with additional performances at Cairo University and in the cities of Ismailia, Helwan, and Beni Suef. We also performed for the Nevada Museum of Art in June 2011 on the occasion of the museum’s 80th-year celebration. The ensemble’s repertoire reflects the great diversity of cultures found in the Middle East. The ensemble performs music and dance from Arab, Turkish, Persian, Armenian, Greek, Sephardic and Oriental Jewish, Kurdish, and Assyrian cultures. Performance items range from classical pieces to religious, folk, popular, and children’s songs, as well as folk, classical, and cabaret-style dances. The MEE performs on traditional instruments such as the pan-Middle Eastern short-necked lute (the `ud), the Turkish long-necked lute (the baglama saz) the end-blown reed flute (the nay), the Persian hammered dulcimer (the santur), the Arab/Turkish plucked dulcimer (qanun or kanun), the Egyptian spiked fiddle (the rabab), the Turkish and Egyptian oboes (the zurna and mizmar), and a variety of Middle Eastern drums (the darbukkah, riqq, bendir, mazhar, tabl baladi, and zarb). In addition, the Ensemble uses the accordion (retuned to accomodate Middle Eastern scales), the violin, cello, double bass, and on occasion, the guitar and saxophone. The Friends of Middle Eastern Music Association (FOMEMA) is an association formed to promote interaction between the Santa Barbara community and the UCSB Middle East Ensemble, explore ways in which the Ensemble can support the larger community in the presentation of Middle Eastern culture, and ways in which the community can support the Ensemble’s goals of an expanded role at UCSB for study and research in Middle Eastern music and culture. The Ensemble has three commercial CD’s, entitled “UCSB Middle East Ensemble In Concert 1994”, ”UCSB Middle East Ensemble, 1995”, and “UCSB Middle East Ensemble, 1996”, as well as a DVD and t-shirts. Two of the CD’s have accompanying booklets with lyrics and musical scores. These products are available outside the concert hall during the Ensemble's performances and also at our Store page. The ensemble's performances are noted for being colorful and fast-paced. Following a tradition developed in Cairo, Beirut, and Damascus, men wear tuxedos while women wear colorful traditional dresses. Group instrumental pieces are quickly juxtaposed with solo instrumentals, solo vocals are answered by choral pieces, with solo and group dances interspersed throughout. Performances generally end with an extended cabaret-style dance set. Founder and director Dr. Scott Marcus received his Ph.D. in music/ethnomusicology from UCLA in 1989, with a doctoral dissertation entitled Arab Music Theory in the Modern Period. In addition to his studies at UCLA under A. Jihad Racy, Scott also studied in Cairo, Egypt with a number of the main teachers at Cairo's two music institutes (al-Ma`had al-`Ali li-l-Musiqa al-`Arabiyyah, i.e., The Higher Institute for Arab Music, and Kulliyat al-Tarbiyyah al-Musiqiyyah, i.e., The Faculty of Music Education, Helwan University). A UCSB Pofessor since 1989, Scott teaches in the Music Department's Program in Ethnomusicology. Students can earn the B.A., M.A., and Ph.D. in Ethnomusicology with an emphasis in Middle Eastern Music. The Dance Director for the University of California, Santa Barbara (UCSB) Middle East Ensemble. Cris! Basimah is an award-winning belly dancer from Santa Barbara, California, specializing in dance styles of the Middle East (including Raqs sharqi) and Latin cultures. Trained in classic and modern ballet, Latin dance styles, Egyptian, Turkish, American Cabaret and Folkloric dance from numerous oriental regions, Cris! mixes a wide variety of techniques for dance to produce entertaining, educating and often innovative performances. She teaches beginner and intermediate belly dance classes at the Gustafson Dance Studio and performs regularly at Santa Barbara's Middle Eastern restaurant Zaytoon. Sue has lead the percussion section since she co-founded the Ensemble in 1989. She has studied Arabic drumming with Souhail Kaspar, Persian drumming with Mehrdad Arabifard and Siamak Pouian, the Armenian d'hol with Sarkis Petrossian, and the Uzbek doire with Tolkin Isakov. She is a lecturer in the Music Department and, in addition to being the Ensemble percussioin director, she teaches percussion in music. The University of California at Santa Barbara can now boast of being home to North America's largest Middle Eastern orchestra. The UCSB Middle East Music Ensemble's emergence as a major cultural presence in Santa Barbara and Los Angeles areas is drawing acclaim and support from nearly a dozen different Middle Eastern communities, as well as a loyal following from the university and other local audiences. Since 1989 the MEE has been a learning aid for the ethnomusicology students. However, the vitality and sheer distinctiveness of the group's performances have propelled it into becoming a vibrant orchestra of 55 members including a dance troupe and chorus. The ensemble has been attracting sell-out crowds throughout California. Since its inception the ensemble has continually drawn in new members from the university's students, faculty, and the larger community. Though a small number of participants are from the Middle East, one of the unique characteristics of the group is that it is composed of Americans of non-Middle Eastern origin who have been attracted by the opportunity to gain hands-on experience of other cultures. Professor Scott Marcus, the ensemble's founder and director, remarks, "One of the first realizations of any new member in our group is the astonishing number and diversity of cultures and musics found in the Middle East." Within the first few weeks of rehearsal students might encounter the driving rhythms of a Lebanese dabke folk dance, the full orchestral sound of modern Egyptian popular song, the syncopated accents of Turkish folk music, and the intricate melodies of Persian music. The ensemble also performs music and dance of Armenia, Morocco, Algeria, Syria, Saudi Arabia, the Assyrian-Chaldean Christians of Iraq, Israel, and includes repertory from the Sufi mystical tradition of Islam. Marcus added: "One student recently told me, 'I didn't even know half these groups existed and here I am playing their music.' That is exactly the type of reaction we strive for from both our participants and our audiences, a recognition of the vast array of ethnicities and cultures present in the Middle East that are so often ignored in media portrayals of the region." 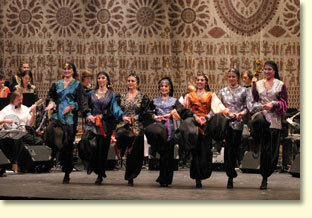 The ensemble plays a special role for the many Middle Eastern communities of Southern California. Its performances provide public recognition and a significant affirmation of the cultural roots of these communities. It has also become a resource for educating second-generation young people about their musical heritage. "The father of one student of Arab origin recently remarked to me, 'I always wanted my son to learn something about Arab music, but it wasn't till he discovered your group that he got motivated to do so," said Marcus. The ensemble's performances are visually stunning. For formal concerts, in accordance with standards set in Cairo, Damascus, and Beirut, the men wear tuxedos and the women don vibrant traditional dresses. The dance troupe perform in colorful costumes from around the Middle East. The stage is crowded with performers playing instruments of all shapes and sizes. Some are familiar to western audiences such as violins, accordion (tuned for Middle Eastern scales), and doublebass. But most are unique to the Middle East such as Arab and Turkish lutes (ud and saz), reed flute (nay), plucked and hammered zithers (qanun and santur), and a wide variety of percussion instruments (dumbek, darabukkah, zarb, tar, and daff). During performances, Marcus gives the audience a brief introduction to the music: where it comes from, what it is about, and also introduces the different instruments, rhythms, and melodic modes. Audience members receive printed programs which include song lyrics and translations. The remarkable popularity of the ensemble lies in part in the ever-changing texture of its performances. Orchestral pieces are interwoven with instrumental solos' group dances, choral numbers, solo vocalists, and solo dancers. The result is a fast-paced, highly-entertaining evening for one and all. "We have an extremely enthusiastic mix of students, teachers, and community members who have come together to give the group real momentum. Our rehearsals and shows are like family gatherings, and I think that it infectious," says Marcus. The group performs regularly throughout California, often playing full-houses at concerts sponsored by ethnic groups like the Syrian Arab American Association. These groups have responded with tremendous support for the ensemble, contributing their time and resources to promote the ensemble and its ongoing efforts. Santa Barbara audiences for their part have formed a community-based organization, the Friends of Middle Eastern Music Association, to raise money for the Ensemble's ongoing needs, create scholarships for university students studying Middle Eastern music, and in general to encourage and support the ensemble's continuing efforts to promote cultural awareness of the Middle East.